Inspired by the high temperatures of the last few years, engineers from Stanford University have created a plastic-based material which can keep pour bodies cool. The idea is that it could be incorporated into clothing items, to cool the wearer’s body far more efficiently than current natural or synthetic fabrics. It is low-cost and makes the person that wears it feel nearly 4 degrees’ Fahrenheit cooler than if they wore pure cotton clothing. By combining nanotechnology, photonics and chemistry, researchers developed what may be the future in clothing and keeping people cool in hot climates without the need for air conditioning. "Under normal conditions, when you're not exercising, about 50 percent of heat is lost through infrared radiation," lead study author Yi Cui, who researches materials science and engineering at Stanford University, told The Washington Post. No fabric on the market is totally permeable to this radiation. "If you could, in the summer time, make this radiation go out with nothing blocking it, you would feel cooler," he explained. 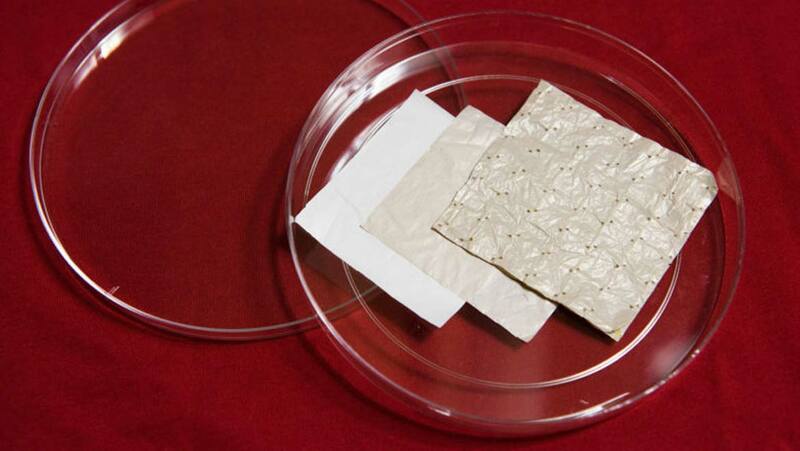 The main idea behind this material is to cool the body by allowing it to discharge heat in two ways. The first one is common in the fabrics that we already use, which is to allow perspiration to evaporate through the material. The second revolutionary mechanism is to allow heat that the body emits as infrared radiation to pass through the material. All objects, including our bodies, throw off heat in the form of radiation. Clothes or blankets that are designed for extremely cold climates or winter months lock that radiation in to keep the person warm. To develop this type of cooling fabric, the Stanford researchers tried to give polyethylene, a clear plastic that is usually used as kitchen wrap, a number of characteristics desirable in clothing, such as to allow thermal radiation, air and water vapor to pass right through it. Finally, the fabric has to be opaque to visible light. Of course, the creation was not easy and developers came across a few problems. Allowing infrared radiation to pass through the material was fairly easy since ordinary polyethylene food wrap does that already. But kitchen plastic is waterproof and see-through, making it useless as clothing. To overcome this issue, they used a different type of polyethylene, mostly used in batteries. This type has a specific nanostructure that is opaque to visible light yet is transparent to infrared radiation. As a result, it could let body heat escape. They then modified the industrial polyethylene by treating it with a chemical cocktail to enable water vapor molecules to evaporate through nanopores in the plastic. To make this thin material more fabric-like, they combined two sheets of polyethylene with a cotton mesh in between for strength and thickness. In order to make sure that this material can be used in actual clothing, researchers placed a small piece of the new fabric and a piece of cotton fabric side by side on a surface with the same temperature as bare skin. They then measured how much heat each material trapped. The results showed that the cotton fabric made the skin surface 3.6 Fahrenheit warmer than the cooling material. Therefore, a person wearing clothing made by this new cooling material may feel cooler than a person wearing clothing made by common cotton. Engineers are continuing their research on several subjects, including adding more colors, textures and cloth-like characteristics to their material. Using a material like polyethylene that is already being mass produced for the battery industry could make it easier to create accessible, inexpensive products. Another advantage is energy saving. For example, if a company is able to cool the person rather than the building where they work that will definitely save a huge amount of energy since the employees will feel less inclined to turn on a fan or air conditioner. This research opens up new techniques to cool or heat things, without the use of outside energy, by tuning materials to either get rid of or trap infrared radiation. Apart from the wearer’s convenience, there are environmental benefits and economy issues that can be resolved by this exciting wearable innovation.